If you're like most Realtors, you're good at working in the present moment. However, the problem with that is, most of the people you connect with aren't ready to buy or sell a house right now—they want to do it in the future. You're quick on the draw with phone and email, but client relationship management is all about data entry, that thing you loathe to do. But time at your keyboard isn't the only drawback—most CRM systems cost serious coin and cause serious frustration. Is the future worth all that? The answer is an emphatic YES! Knowing where your next dollar is coming from makes everything more enjoyable. Less stress and more freedom? Yes, please. If you've met me, you know that I'm not a fan of anxiety or overwhelm. And I recommend using Mailchimp because it's simple, affordable, effective, and, most of all, it's yours. But another reason I loooooooove Mailchimp for Realtors is that you can use it for client relationship management (CRM). So in this post, I want to show you how to collect information about your contacts, organize the info and get to know your audience, take action on what you know, and learn what works and improve your marketing. Mailchimp makes collecting contact information a team sport. Import the contact data you have and collect additional subscriber information with signup forms. The result is less data entry for you. 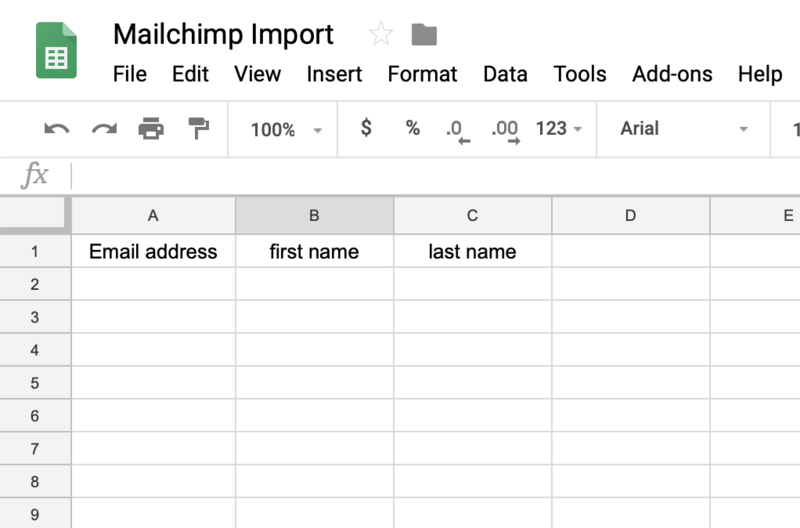 You can import email list subscribers directly into Mailchimp with a simple spreadsheet you create in Google Sheets or Excel. The only required field in Mailchimp is an email address, so the data you import can be as simple as email address, first name, and last name (example above). Or you can import additional data like address and birthday. Before you start building your spreadsheet, be sure to read Mailchimp’s Format guidelines. Some fields, like address and birthday, must be formatted a specific way to import correctly. After the information you want to import is formatted correctly, save as a CSV file, and head over to Mailchimp. Here’s a quick video tutorial of how to import your CSV file into Mailchimp. Not everyone you import into Mailchimp is an email subscriber—and that’s okay—but it’s likely you still want access to the data to follow up by phone or mail. So, how do you import these contacts and their information but avoid emailing them on accident? It’s as easy as 1-2-3. Forms for sharing: Landing pages and regular hosted forms are published and maintained on Mailchimp. If you don't have a website, these two options allow you to capture leads. For example, you could run a social ad to a landing page, capture leads, and follow up with a drip campaign. You could also share the link to your regular hosted form on social media. Forms for your website: If you have a site, Mailchimp offers embedded and pop-up forms to help you grow your list. There are also integrations with WordPress and Squarespace that make setup a snap. Forms for mobile: Mailchimp Subscribe is a mobile app for your tablet—iPad and Android. It's a beautiful tool to collect signups at open houses and other events because it syncs with Mailchimp and adds subscribers automatically. Typically, it's best to keep the fields on your signup forms to the bare minimum, such as email address and first name. However, you can use Mailchimp's hosted signup form to display more fields and collect extra information that will help you personalize every subscriber's experience. Use embedded and pop-up forms on your site to collect the essentials, and send subscribers to your hosted form (via email) when you want more information. It's much easier to build a relationship when you know how to add value. Signup forms are great tools because they help you figure out how to do it. When you enter contact information, Mailchimp stores the data in fields which are visible in the list view and profile pages. The usual suspects are there by default (email address, address, phone, website, etc.) but you can also create custom text, number, and date fields. A basic Mailchimp account offers 30 data fields for each contact, but if you need more, you can upgrade to Mailchimp Pro, and you’ll get 80 fields. In Mailchimp, you can categorize subscribers by interest or preference. These collections of subscribers are known as groups. You can add subscribers to groups inside Mailchimp, but groups are intended to be contact-facing—meaning that your contacts can see the groups (unless you hide them) and choose which groups they want to join. For example, in your signup form, you can ask "How often would you like to hear from us?" And your subscribers can select "weekly, monthly, or quarterly." These subscribers are then placed into the weekly, monthly, or quarterly groups, automatically. When you add subscribers to groups, you have the option of sending them an email or email series, automatically. This could be a welcome email to new subscribers or an email series to subscribers who indicate they are interested in buying a house. Another easy way to organize contact information internally is with tags. For example, you can organize your contacts by type (vendor, client, Realtor, lead) and how they were referred to you (social ads, friend, print ad, etc.). When subscribers are tagged, you have the option of sending them an email or email series, automatically. Tagging also makes it easy to send relevant emails to your subscribers. For example, the email about your new listing can be tailored for and sent to past clients who actively send you referrals, Realtor peers who want your listing information, and active clients who are looking for a home. When you have your contacts organized in a meaningful way, it allows you to send the right message to the right person at the right time. You can use segmentation—slicing and dicing your list into smaller sections—to make your marketing more relevant. For example, instead of emailing your entire list, you can create a simple segment of buyers and email them your new listings. You can also create complex segments in Mailchimp to target a section of your list that matches any or all of up to five specific conditions. For example, you can send a new listing to subscribers who meet all of the following four conditions: 1) they are buyers, 2) they are interested in NE Portland neighborhoods, 3) they are interested in homes with ADU potential, and 4) they opened your last five emails. Advanced segmentation is also available with a Mailchimp Pro subscription. It allows you to get even more granular with your segmentation (plus other bells and whistles). Mailchimp's automations "help you get things done while you get other things done." For example, you could run a social ad and direct traffic to a landing page, and send an email series to people who subscribe—all happening while you host an open house, meet with prospective clients, or whatever else is on your to-do list. Your results will improve as you learn more about your subscribers and use that information to segment and personalize campaigns. You can only improve what you measure, and thankfully, Mailchimp does all the heavy lifting. The data from all of your marketing campaigns is in one place and presented in a way that's easy to understand. You'll be able to monitor trends, track your performance, get to know your audience, and improve your marketing. The Mailchimp mobile app makes it easy to keep tabs on your campaigns and keep an eye on reports while you're on the go. 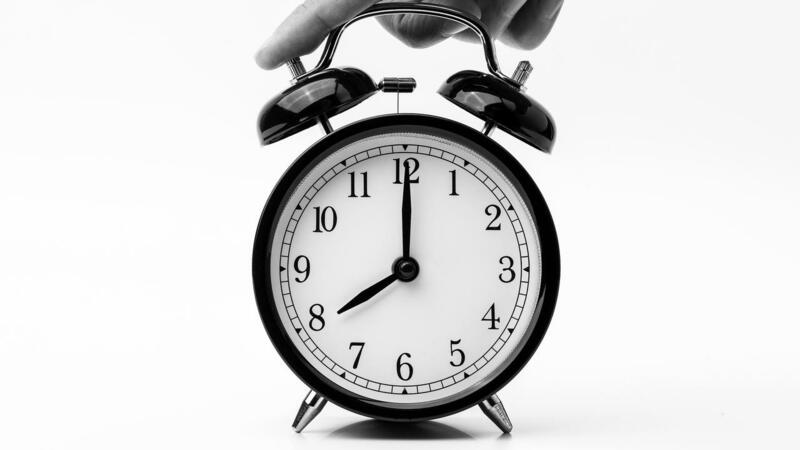 Don't put off building your email list and growing your business. Start creating your future today!